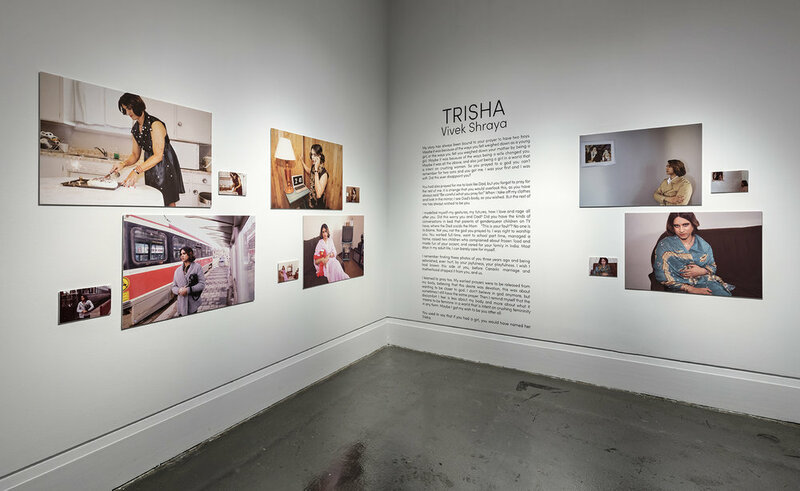 Trisha is a photo essay from Toronto-based multidisciplinary artist, musician and writer Vivek Shraya. Shraya recreates the scenes from vintage photographs of her mother as a way of both asserting connection and discovering difference between their experiences of femininity. Vivek Shraya is a Toronto-based artist whose body of work includes several albums, films, and books. Her first book of poetry, even this page is white, won a 2017 Publisher Triangle Award and was longlisted for CBC's Canada Reads. Her debut novel, She of the Mountains, was named one of the Globe and Mail's Best Books, and her first children's picture book, The Boy & The Bindi, was featured on the National Post Bestseller List. Vivek has read and performed internationally at shows, festivals and post-secondary institutions, including sharing the stage with Tegan & Sara. She is one half of the music duo Too Attached. A four-time Lambda Literary Award finalist, Vivek was a 2016 Pride Toronto Grand Marshal, a 2015 Toronto Arts Foundation Emerging Artist Award finalist, and a 2015 recipient of the Writer's Trust of Canada's Dayne Ogilive Prize Honour of Distinction. In this age when most of our photos are stored on our phones, dusting off a photo album and flipping through its pages is now an infrequent activity. However, when we do decide to interact with these tangible reminders of our and our loved one's past, the experience can be a powerful one; sentimental, nostalgic, melancholic, surprising, humourous, or unsettling. Toronto-based multidisciplinary artist, musician and writer Vivek Shraya mines just this experience with her own family's photographs, creating a photo essay that is both personal and universal. The project came to life when Shraya was promoting her 2014 short film Holy Mother My Mother. When giving talks about the film, which documents a family trip to India, Shraya showed a photograph of her mother, noting the resemblance between them. A subsequent search for more photographs brought to light a side of her mother that Shraya never knew - as a newlywed, a new immigrant, and not yet a mother - and what was always a search for deeper connection between mother and daughter became one that celebrated differences as well as similarities. In Trisha, Shraya presents found photographs of her mother alongside her own, painstakingly re-staged ones, with herself standing in for her mother as subject. In the text that accompanies the photo series, Shrarya speaks of the experience, while growing up, of aspiring to be like her mother and the shock of encountering, through these photographs, that her mother was then, as now, not only her mother but a woman in her own right, with a history and identity that went beyond what Shraya had known. In the original photographs, Shraya's mother is alone in the frame, often staring directly into the camera - at times seductive, defiant, or contemplative. In replicating these scenes, these looks, Shraya positions the camera - and the viewer - as a conduit for connection across time, across generatoins; the artist's mother looking into her future, perhaps anticipating a yet conceived of family looking back, and Sraya, placing herself almost literally in her mother's shoes, looking out from her own vantage point back to her mother at the same age. There is a power and vulnerability in Trisha. As Shrarya remakes herself in her mother's image, her text poetically and poignantly speaks to how this action might have been perceived by her. In performing femininity in her mother's likeness, Shraya is both resolute - speaking back to the world that still sees women and the feminine as at best inferior and which caused her mother to pray for sons, and wistful - considering, perhaps, who Trisha might be and what her relationship with Shraya's mother might be like. Together, these two interconnected series of photographs, in their overt, surface level similarities, and subtle, often playful differences craft a nuanced portrait of mother-daughter relationship that contains the multitudes of both women, and speak to the forgotten, unrealized or as yet undiscovered aspects of ourselves that haunt us all. Banner image credit: Vivek Shraya, Trisha 1b, Digital print.